First project: Collapsible Work Bench. The better to do all the other projects with, my dear! The Woodwright's Apprentice, ISBN 0-8078-4612-0. I got the wood, 12' 2x10 Red Oak and 12' 1x10 Red Oak from Jackel Enterprises, Inc. in Watsonville. 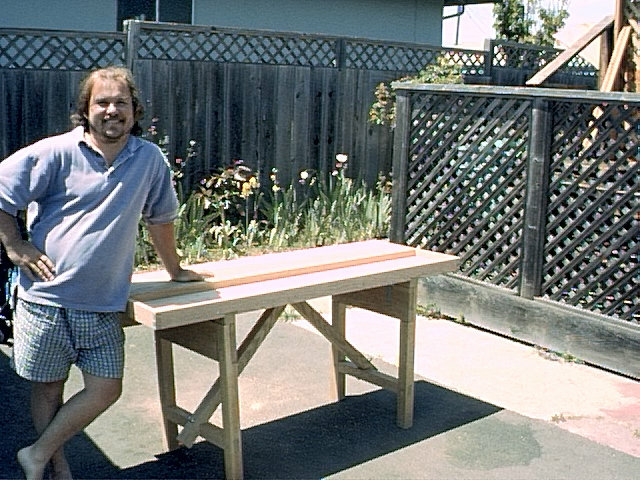 The main challenge was to take Roy's advice and build the bench using hand tools. Oak grain has an interesting behavior, which I may have missed, had I just been running it through the table saw and jointer. While working on this bench, I listened to Jack Kerouac's On The Road, thanks to Recorded Books and our local Santa Cruz County Library. Did you know that Beat, as in the Beat Generation, stood for Beatific? The next project, which was supposed to be a birthday present for Diane almost 3 years ago (oops!) is a storage ottoman made from walnut and red oak plywood. A removable tray holds smaller tools and supplies, while the lid bracing has been notched for long crocheting needles. The main well holds the current work in progress, whether a rug or a comforter, safe from the cat hair. Did I mention we have cats?